In mid-November, before the snows started flying, I went up to the big food market in town to see what end-of-autumn stuff was around. Seeing a pile of pumpkins was a bit startling, post-Halloween. It seems like pumpkins are meant to be carved decoratively, smashed in the road by teenage hoodlums and not thought of again until next autumn. Their purpose after Halloween is unclear to me. Foodwise, I was stumped what to do with them other than pumpkin pie. Then, since this market is in my city’s Little Italy, I remembered noticing, in Diane Seed’s great The Top One Hundred Italian Dishes, a recipe that involved a pumpkin. I like this book because a lot of the dishes are very plain. The recipe for boiled meats is precisely several types of meat boiled, for example. There’s a weird, tweed-jackety comfort to extremely plain food. It’s probably, I think, a lot closer to the way people actually eat than the recipes we tend to associate with national cuisines, which is similar to the way we’re presented international competitions of fireworks displays, this explosion representing Italy, that one China, etc. I don’t want to eat explosions. Thinking of boiled meats and boiled pumpkin made me think of the kind of food Marcello Mastroianni and Anouk Aimee might have sampled in the whore’s kitchen in La Dolce Vita before they crossed the room in their evening wear, walking on planks draped across the flooded floor, to the bedroom. 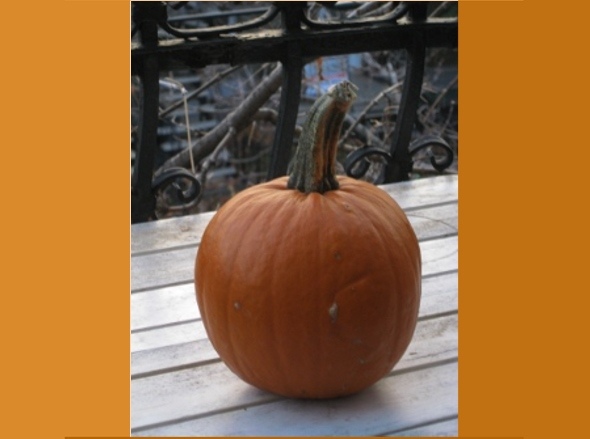 Anyway, I figured the pumpkin would reward me somehow so I picked out a small one, about three pounds, and brought it home. Dismantling the pumpkin was almost as weird and difficult as taking apart a crab or some other kind of small animal. Maybe because we make it personal by carving faces in them. But they are hefty things, and they have a tough hide. Seed claims the recipe comes from Basilicata in southern Italy. The Italian giveaway is that it uses white beans. She sautees two cloves of garlic in 3 tablespoons of olive oil, adding the pumpkin’s flesh which has been finely sliced and a bay leaf, pinch of salt and cayenne pepper, covering it to cook until the pumpkin is tender, with a bit of water if needed (I didn’t use any). About 250 grams of white beans are stirred in at the end and a few fennel seeds are scattered over top. It’s a really subtle dish.